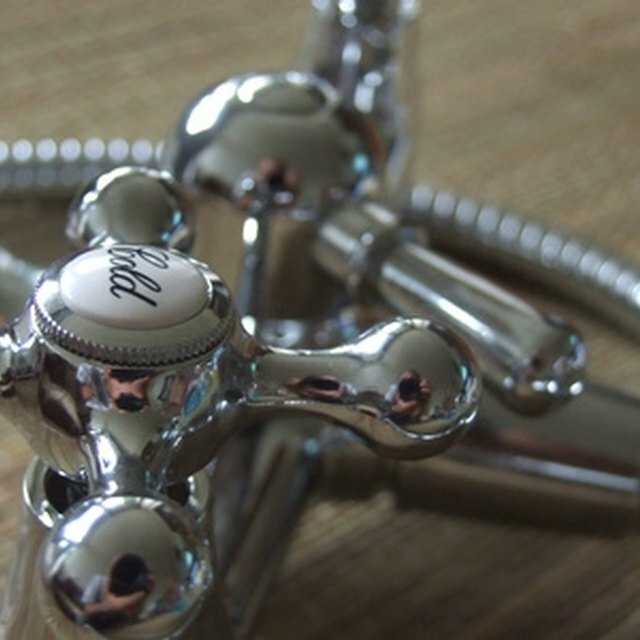 When repairing a Delta shower faucet, understanding how it works is an important factor. The Delta pressure balanced scald-guard faucet cartridge protects you from both burning and chilling temperatures while you are relaxing in the shower. Repairing shower faucet leaks saves water and money. The cartridge works with an internal temperature balancing spring-loaded mechanism that allows more or less hot or cold water through the faucet depending on the requirement at the time. If your Delta shower faucet is leaking or not controlling the temperature properly, you need to replace the faucet cartridge as soon as possible for your family’s safety. Turn off the main water supply to your home. You may need to shut it off at your city water meter, well house or in your basement. Remove the handle by popping off the plastic index-button in the center of the shower faucet handle by hand. Unscrew the handle mounting screw with a screwdriver. Slide the handle off the cartridge stem. Take off the bottle shaped trim sleeve that covers the faucet body. Grasp it firmly with your hand, pull and twist at the same time until it comes off. If the o-ring falls off, place it to the side for now. Unscrew the cartridge bonnet nut by hand if possible, if not use a pair of slip joint plies. The bonnet nut is a shiny chrome or brass colored ring that holds the cartridge in place. Pull the old faucet cartridge straight of the faucet body. Remove any trash or debris left inside the faucet body with a clean rag. The new cartridge needs a perfectly flat surface to seat on. Insert the new Delta shower faucet cartridge in the faucet body. Line up the directional tab on the cartridge with the indention on the faucet body to align the unit correctly. Screw on the bonnet nut by hand and secure with slip joint pliers. Slide the trim sleeve back on the faucet body. Roll the o-ring one inch over the faucet body first, if it fell off before. Set the handle on the cartridge stem, turn it to the off position, and then turn the water back on. Adjust the Delta scald-guard water temperature indexer, the small plastic dial on front of the new Delta cartridge. Turn the faucet on and test the temperature of the water with a baking thermometer. Retest the temperature of the water each time you move the indexer dial. When you are satisfied with the result, replace the handle mounting screw and index-button. Apply a small amount of plumber’s grease on the handle setscrew before reinstalling. Setting the maximum water temperature above that of the manufactures’ recommended setting is dangerous. Apply a small amount of plumber's grease on the handle setscrew before reinstalling. Setting the maximum water temperature above that of the manufactures' recommended setting is dangerous.